Waverly Inspirations Elephant Matte Chalk Finish Acrylic Paint, 1 Each, 8 Fl. Oz. Inspired by the rich colors and patterns of classic Waverly fabrics, Waverly Inspirations Matte Chalk Finish Acrylic Paint is perfect for transforming flea market finds and reviving old furniture. The soft matte colors in this Walmart-exclusive line were carefully curated to coordinate with textiles and designs produced by Waverly, a name synonymous with home decor since the early 1920s. Waverly Inspirations Matte Chalk Finish Acrylic Paint is perfect for reviving decor with easy-to-use color. No special prep is needed before applying the highly pigmented paint to walls, wood and metal furniture, and decorative accessories. It provides superior coverage and a long-lasting, fade-resistant finish. The versatile formula is lovely alone, and also works beautifully for layered and distressed techniques. For best results, use with Waverly Inspirations brushes and applicators, and enhance project durability with Waverly Inspirations Wax. ? Inspired by the rich colors and patterns of classic Waverly fabrics, Waverly Inspirations Matte Chalk Finish Acrylic Paint is perfect for transforming flea market finds and reviving old furniture. The soft matte colors in this Walmart-exclusive line were carefully curated to coordinate with textiles and designs produced by Waverly, a name synonymous with home decor since the early 1920s. Waverly Inspirations Matte Chalk Finish Acrylic Paint is perfect for reviving decor with easy-to-use color. No special prep is needed before applying the highly pigmented paint to walls, wood and metal furniture, and decorative accessories. It provides superior coverage and a long-lasting, fade-resistant finish. The versatile formula is lovely alone, and also works beautifully for layered and distressed techniques. For best results, use with Waverly Inspirations brushes and applicators, and enhance project durability with Waverly Inspirations Wax. ? 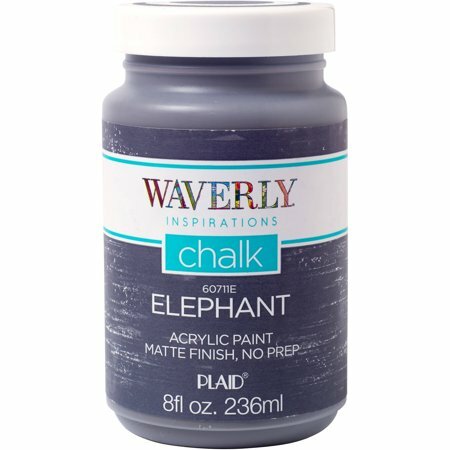 Waverly Inspirations Matte Chalk Finish Acrylic Paint by Plaid, Elephant, 8 Fl. Oz. :Wide-mouth 8-ounce bottle. Covers approximately 20 square feet. Prep-free. Superior coverage and fade-resistant matte finish.Works well for layered and distressed techniques.Waterbase for easy soap and water clean-up. Certified AP non-toxic. It was so easy to work with and was easily covered & not thin at all! 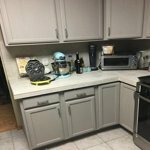 I was able to do my oak kitchen cabinets with just 2 coats! Better than Rustoleum brand that I tried! Used a perdy brush and didn't have any brush strokes and I didn't have to sand at all before the wax coat. 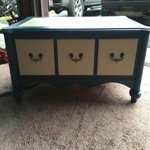 I sanded some other furniture pieces for the distressed look and they turned out gorgeous. This paint is the smoothest paint I have even touched once sanded !!! Mineral color seemed like better coverage than the white. Bought one bottle to cover an octagonal coffee table. Tooks three coats (no prep) to get uniform coverage and the bottle is not quite empty! Much darker than pictured, more of a mustard color than a curry... But still pretty! 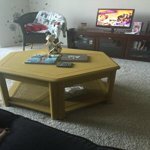 I refurbish furniture for a living. Love love love this color-its not really a yellow, not a beige, not a sand, but somewhere in the middle. This black chalk paint covers a multitude of sins! When its waxed it gives a look of beauty! Used this paint on plastic!! It worked!! I love this paint! 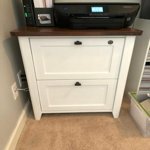 I bought a solid wood office cabinet for super cheap, but it had that ugly, shiny, cherry finish. 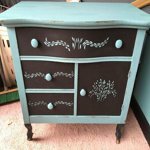 I sanded the top down, restained it brown and painted the body with this chalk paint. I also changed the knobs. It looks like a nice piece of rustic farmhouse style furniture now and not an eyesore. The creates a great shabby chic look! 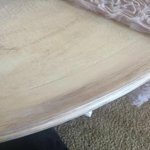 For my project below I painted a table white, sanded to distress, added the antique wax (same brand) into the crannies then finished off with this white wax. It's super easy to use, it is more of a runny wax so protect your area. Chalk paint gives great coverage on a variety of surfaces, such as wood, plastic, metal and glass without primer. The only prep I did was making sure the surface was clean by washing it with a mild dish detergent and water. I used my paint to paint a wood medicine cabinet that had seen better days, as well as a plastic clothes hamper that was an ugly color. 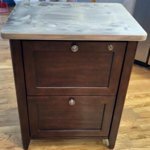 You can "finish" it and add a bit of shine and protection with polyurethane or leave it as is for a more chalky looking finish. As an added bonus, Waverly Brand---carried only at Walmart---is significantly cheaper than most chalk paint. 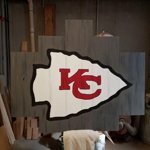 I used this paint to make my son a KC Chiefs sign for his man cave for Christmas. It went on smoothly and was an easy cleanup. I did give everything 3 coats but 2 would have probably been sufficient. I did not use the wax finish on it as I didn't think he would wax it every 6 months as recommended. I sprayed it with polycrylic spray to finish it off. The colors did not run and it looks pretty good. This paint is really thick. If I wouldn't have watered it down a lot one bottle would have been mostly used on one backside of a tall but narrow - 6 feet by 2 1/2 feet wide - corner bookshelf. As soon as there was room in the bottle I kept adding water. This created a much thinner paint that let a little more of the wood details show through so I didn't have to sand it to get the distressed aged look at all. Pleased with the results and I still have half of the bottle left. 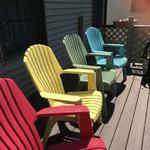 Depending on how light you want the coat of paint to look, add a little water and test it. Otherwise it's very thick and will cover completely. The wood I painted on is light in color so I don't know how it would look trying to cover a darker wood. If you like wood detail from a darker wood to show through try a test spot with the paint watered down and if it's too light do another coat. Otherwise you might have to sand it to get the faded aged look.